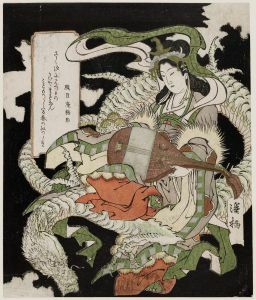 Or, a Generally more accurate recounting of the Legend of Benzaiten of Enoshima than is generally found in comparative mythology texts. In the Islands of Japan, off the Eastern Sea Route, lies the Isle of Enoshima. 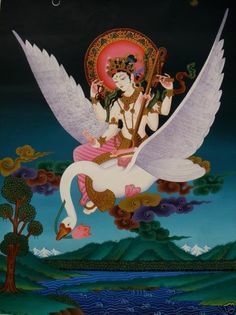 This island is sacred to the goddess Benzaiten. On this Island Enoshima, there once was a lake where a wicked dragon king made his lair. He was terrifying to behold, as his body was wreathed with stormclouds, and lightning darted from his piercing eyes, blinding to see. No one dared approach the lake, and the valley where it lay became a haunt for wild dogs and fearsome creatures, while the trees and thorns grew tight and tangled. Posted on July 4, 2015 November 4, 2015 by Redfaery	This entry was posted in 30 Days of Devotion and tagged Benzaiten. Bookmark the permalink.